Magda Abu-Fadil, director of the Institute for Professional Journalists at the Lebanese American University, visits with Mr. Marcello Scarone, Programme Specialist, Division for Freedom of Expression, Democracy and Peace at UNESCO in Paris in June 2002. UNESCO has been a partner and sponsor of IPJ’s activities. 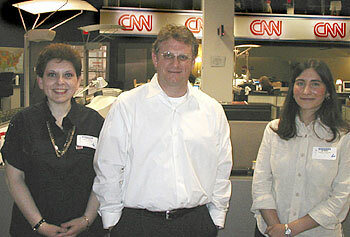 IPJ director Magda Abu-Fadil and LAU’s publications assistant director and web designer Karina Rodriguez flank Mr. Mitch Gelman, senior vice president and executive producer of CNN.com, at CNN headquarters in Atlanta in June 2002. The IPJ has benefited from contacts with senior CNN personnel, visits to the world's news leader's headquarters and CNN’s presence at IPJ conferences. 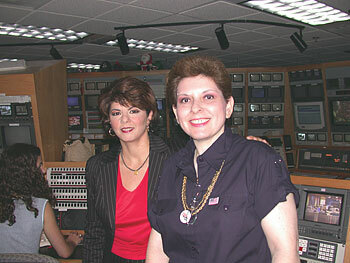 LAU alumna and CNN senior international editor and anchor Ms. Octavia Nasr hosts IPJ director Magda Abu-Fadil at the CNN World Report studio and control room in June 2002. Nasr has been a regular guest speaker at IPJ conferences.